There's been a wrinkle in the plan. Kaiji and his partner, Sakazaki, have a disagreement about next steps. Kaiji returns to tell Sakazaki the good news, that he has a plan to defeat the man-eating Bog, only to discover that Sakazaki has thrown a tantrum and run off with the seed money. 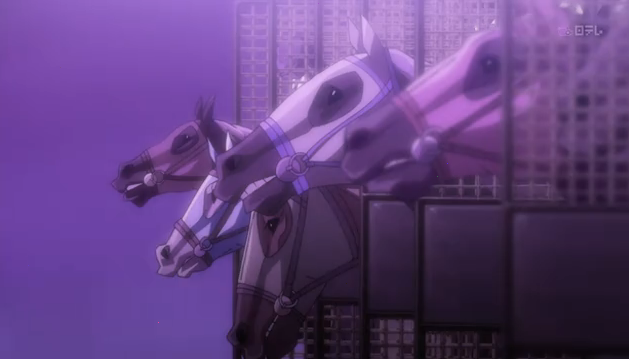 Knowing full well that Sakazaki is doing something stupid, Kaiji tracks him down at a race track, where he is trying to put ¥6 million on a horse at 11:1 odds. 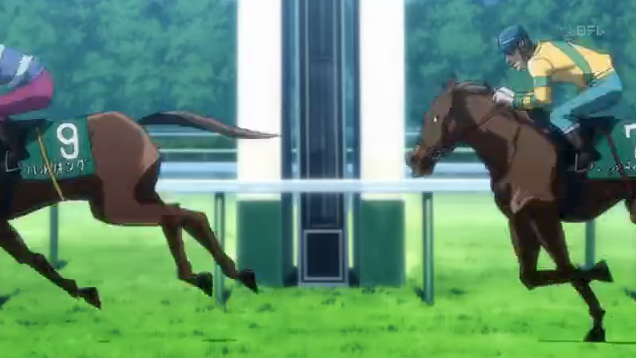 He thinks it might win because it is named like his daughter, and the jockey’s name sort of sounds like “miracle”. Kaiji, unimpressed, grabs the money and runs until the betting window is closed. One of the great things about this was how fast the horse race went by. 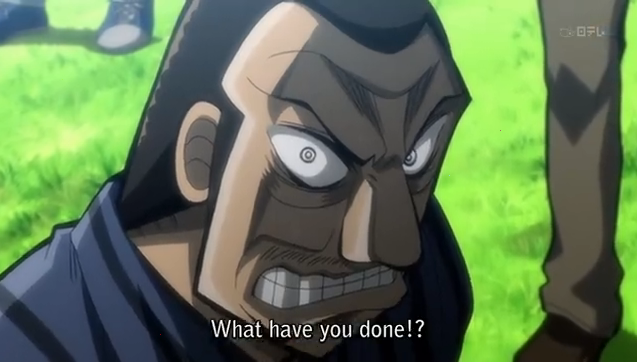 In just a moment Sakazaki goes from cursing Kaiji for blowing his big chance to hearing the shameful results. There is a reason a horse is given 11:1 odds. It is because there is very little chance that it will win. Endoh, the loan shark that got Kaiji in this mess to begin with. "Whom I will trust as I will adders fang'd"
The plot takes a great turn when Kaiji declares that he has someone he wants to add to the team. I never would have guessed it would be Endoh, who has fallen on hard times, and is desperate to pay off some loans of his own. The surprise, Kaiji’s audacity, and the neatness of bringing in the second character we were ever introduced to in Kaiji’s universe (way back in the opening of the first episode of season one) all combined to make a great moment. Team Kaiji is now complete. 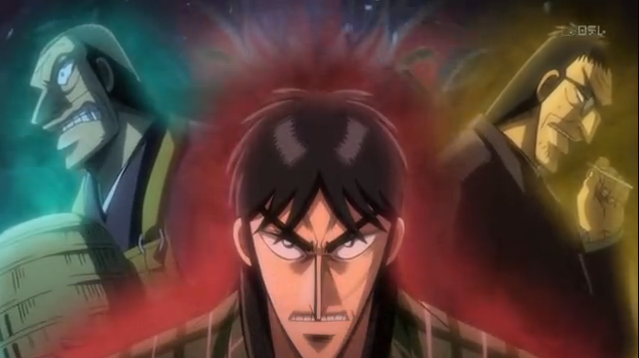 At this point we don’t quite know what Kaiji’s plan to beat the Bog is. Last week’s hint had something to do with the pin setting equipment. This week suggested something related to construction. Endoh also is providing some thugs (for a modest fee). Finally Sakazaki is shown wearing the traditional garb of the Komusou, or Priest of Nothingness, a type of mendicant Zen Buddhist monk. This was mostly a setting things up episode, but I found it quite entertaining, due to Sakazaki’s questionable utility, and the surprise return of Endoh, I’m really looking forward to the second half of the story, and hope Kaiji finally manages to beat the Bog, and escape from slavery, without losing any body parts. I am surprised Kaiji doesn’t show any resentment towards Endoh, he is cautious and knows how to handle him but isn’t cursing him for tricking him multiple times. He was like that in the first season as well. There were people he trusted who took advantage of him, but he forgave them. Maybe he has spent so much time amongst the scum of society that he finds that kind of behavior the norm? I loved how Kaiji pretty much turned Endoh’s usual recruitment scheme against him here, especially he’s facing the same situation he put Kaiji in now. Come to think of it, this arc is starting to remind me a bit of Restricted Rock Paper Scissors in its focus on team building, hopefully with a wiser Kaiji this time. He clearly doesn’t trust Endoh, but both of his partners are pretty sketchy and the team is only really held together by self interest, so I wouldn’t be surprised to see Kaiji get betrayed in some way. 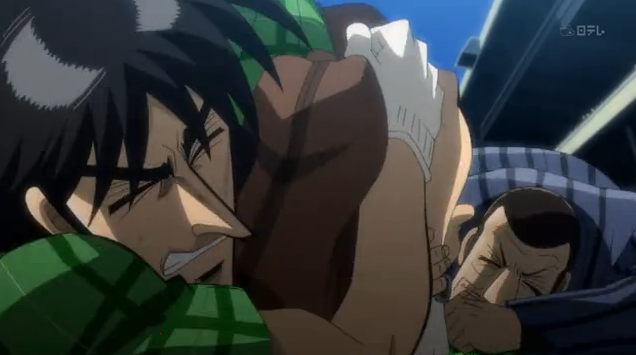 Definitely looking forward to seeing more of Kaiji’s plan in action, it looks like this could be huge. Yes on all accounts. Very interesting team dynamics. 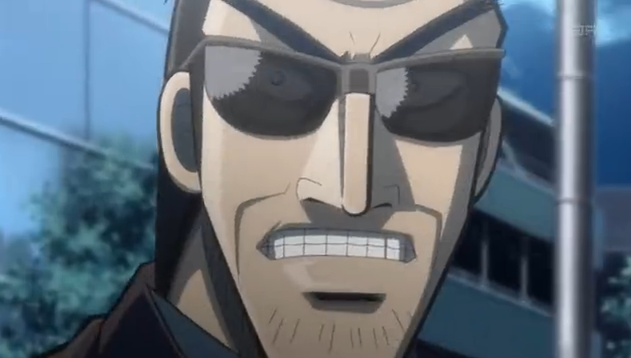 Kaiji is the kind of person who works with what he has, and he has a real snake and a habitual gambler. Interesting to see what he can pull off.